For the first time in at least eight years, House appropriators will grill the Pentagon’s top civilian and uniformed leader about their budget request behind closed doors, not in an open hearing. Defense Secretary Jim Mattis and Chairman of the Joint Chiefs of Staff Gen. Joe Dunford will sit before the defense subcommittee on Wednesday to talk over the military’s $686.1 billion request for 2019. It’s not the largest defense budget ever, but the $80 billion bump over legislated spending caps and the bipartisan budget deal that delivered that figure both represent a massive victory for Pentagon leaders and Congressional defense hawks. Where those dollars will go, however, will be discussed in a session closed to the public. Committee aides said the closed hearing allows members to discuss classified information and make the best possible funding decisions. And Mattis and Dunford have already testified in an open hearing with the House Armed Services Committee this year; they’ll do so again with its Senate counterpart on Thursday. But the appropriations committee’s decision to keep their public oversight private comes at a time when the Pentagon has been clamping down on media engagement and becoming less transparent with data and information. Mattis and service leaders have repeatedly told their people to be more circumspect in their public communications. That guidance, and similar statements last year, have chilled communications between the military and the public, whether leaders meant it to or not. When questioned, Pentagon leaders have repeatedly said that they are willing to be candid with lawmakers — and the American public should trust in their representatives and military even if all the details don’t make it into the open. The message seems to have started to resonate with overseers on the Hill. As far back as the House Appropriations Committee provides data, they held public hearings with the defense secretary and the joint chiefs chairman, saving the closed sessions to grill geographic combatant commanders, the intelligence chiefs, and a few others. But readiness itself has become a sensitive matter of discussion. 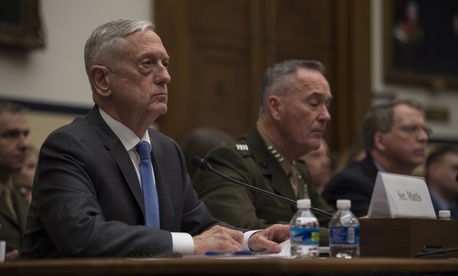 "I suspect it may have a lot to do with questions about readiness shortfalls, which Mattis has said he does not want to discuss publicly," said Todd Harrison, who directs defense budget analysis at the Center for Strategic and International Studies. "I think many members of Congress are eager to hear how the budget increase DOD received this year is going to help improve military readiness—and if not, they’ll want to know why."